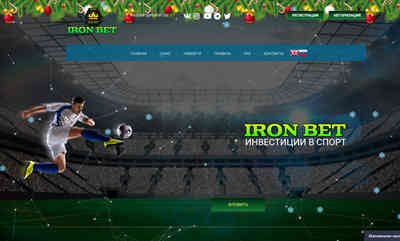 Iron Bet.biz provides its services in the Trust Management bookmakers. We work for everyone. For those who want to earn money, who does not understand all the intricacies of the betting business, who does not deliberate rates and pologaetsya luck. Iron Bet.biz assumes investment management clients bookmakers. You invest, we bet and win, you - earn! It's simple! Occur every day thousands of interesting events in the world of sport in the world, but we are not bystanders or spectators of these events - thanks to them that we earn. we have gathered the best specialists among bettors and analysts who have experience not only to generate income from sports betting, but also their own strategies. A team of professionals Iron Bet.biz well suited to solving the profits on bets. After studying the sports event, analyzing every possible outcome and calculate the most probable event, we make hundreds of bets per day and get the most advantageous profit. You are given the opportunity to generate passive income. That is why, we have expanded our capabilities and create an investment platform "Iron Bet.biz" !! !